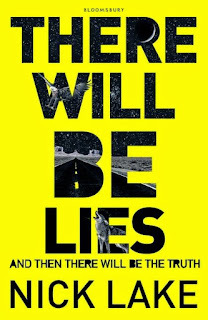 There Will Be Lies, is Lake's third appearance on the Carnegie list since I've been following it, but I have to confess that TWBL is the first one I've read. The book starts of ordinary enough- modern day Arizona. A dry, dusty, infinitely flat place that has been Shelby Cooper's world since she moved from Alaska as a baby. Homeschooled by her mother and obsessively shielded from the outside world, Shelby is intelligent, naïve but with an appealingly defiant, snarky attitude. The book's other location, "The Dreaming" shows up later on- a mythical space that exists beyond time and before our World and is inhabited by figures from Native American folklore, some of which can pass into the real world. When the over protected, apparently super-vulnerable Shelby is knocked down by a car when standing outside the library, a coyote appears with the message that "There will be two lies. And then there will be the truth". This cryptic, bizarrely delivered message starts off a chain of events that ultimately highlights how fragile our sense of identity is. Shelby discovers that everything her world is built upon is nothing more than a flimsy web of lies and deception and that her whole reality is threatened by the newly revealed truth. Though I don't want to give too much away, I do want to mention that the final section of the book, post truth, I found to be the most thought provoking and certainly the most emotional. How do you deal with a discovery like that? It's a really unexplored perspective of an unusual crime. The theme of identity runs thickly throughout the book. Do we change as we get older? Are we always the same person? What makes us the person that we are? What does a person take into account when building their identity? *Do we* build our own identity or is it built for us? What's left when somebody takes those things away? Do we ever really know ourselves or the people around us? I really liked Shelby as a character, she was sarcastic, clever and kind of lippy which makes her a really believable, authentic feeling teen girl. I liked her little asides to the reader (the one about her mom's Pyjama jeans especially made me laugh). When Shelby discovers she can enter The Dreaming, she is given a mission by Coyote (Capitalised, as in the archetypal trickster or lore, and AKA Mark, hot library guy). Shelby must rescue the Child and kill the Crone, or the world will end. It seems fairly high stakes and there isn't much contextual information available. It transpires to be a quest with more personal consequences to Shelby than it initially appears. In the possibly real, possibly metaphorical world of The Dreaming, the Crone has kidnapped and imprisoned the Child to give her more power. Archetypally evil character that she is, this is preventing the rain from falling, parching the land of The Dreaming and starving its majestic wildlife. It's a fairly by-the-numbers quest, complete with animal helpers, flimsy frayed rope bridge and slavering wolves, but it takes on a new significance as Shelby starts to unravel the lies in her own world. I liked that it's never really made clear how concrete the Dreaming is, but the mirroring of the Draming's problems and Shelby's real-life crisis is skilfully managed and it adds a new dimension to the plot. Whilst I found the real-world Thelma and Louise scenario to be much more gripping to read, I can see what this fantastical fantasy world added to Shelby's story, and it provided her with the perspective and the tools to do what she needed to do in the real world. It's hard to talk about this book without giving too much away. It's a twisty, intelligent and original thriller that throws some surprising twists at the reader- there are a lot of OMG moments that the reader needs to feel for themselves in order to even attempt to grasp the extent to which Shelby must be reeling. The story is at first glance quite far-fetched, but it's constructed in a way that makes the whole thing quite believable and ultimately tragic. I do think it will make the Shortlist but I'm not sure about taking home the title- we'll have to see who else makes the final 9.